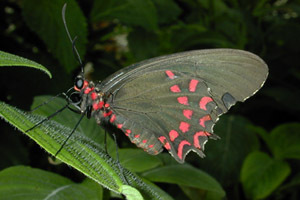 Description: Parides are understory species in many regards. They will feed on cloudy days or in the early morning or late afternoon. They try to stay out of the full sun, perching under plants in the shade when the sun is high. They are often found at field edges or riversides, where they can find flowers close to their beloved forests. In the Butterfly House, they can be found perching under the Ficus trees or drinking nectar in the shade.